Although Sunday mornings are always a good reason for a bit of celebration, this Sunday is extra special as it is the birthday of a friend of mine, who I had the pleasure to meet just a mere week ago. She is a sweetheart who sings like a bird and has three unicorns tattooed on her chest. One evening, we had a conversation about her tattoo, which lead to her telling how much she loved unicorns. I found it such a quirky thing to say; it really sounded as if we were talking about cats, dogs or other animals that actually exist. 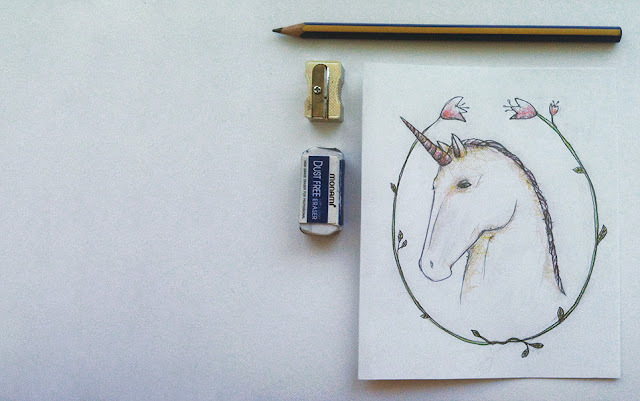 So, last night I grabbed my pencil and drew a unicorn for her. It's been a while since the last time I drew a horse, but thanks to having spent my early teens drawing nothing but horses, my hand hadn't completely forgotten how to do it. Have a magical Sunday filled with magical animals and nice things to eat! NOTE: No pun intended; unicorns are endangered species and horse mettwurst is kind of gross anyway. More Secret Mission reports later!